I stayed here with my mom and sister. I can say that everything was just perfect. Breakfast is a tasty meal that will take you through the day! Staff was extremely nice and helpful. Pedro and Morad help us book a trip, also with every possible question we had about the country and Marrakech itself. It's a cozy place with beautiful tradition Riad decor. You'll find yourself studying the details in the walls. Finally, best value for money in this trip so far. Definitely recommend it. Ótimo hostel, os funcionários te fazem se sentir em casa e te ajudam com tudo que for preciso. Nada a reclamar. 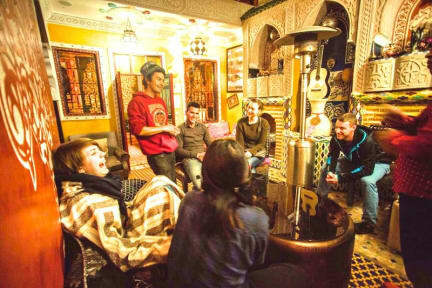 The best hostel in Morocco! The place is amazing and the staffs are very friendly and helpful! Hostel muito bom, atendimento impecável. Me senti em casa, Rachid e outros funcionários são nota 10 ! 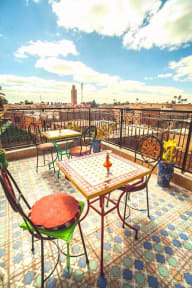 Great Riad, located just 5 min walking from the Plaza. The staff were fantastic, specialy Rashid, who was VERY helpful and kind, and the girls were kind as well; the other guy was kind of moody most of the time. Breakfast was very good. The dorm room was small, but the bed very confortable. Showers were always hot, but as it's a Riad, the bathroom didn't have 100% privacy, because the door didn't cover the whole entrance (like a locker's room shower). Overall was nice. I would stay there again. Os funcionários são maravilhosos, super prestativos e fizeram de tudo para que me sentisse casa. O quarto era meio apertado, não tinha espaço para colocar muitas malas, nem armário, pois no centro da Medina os prédios são apertados mesmo. O banheiro estava com um vazamento de água no vaso que não foi solucionado nos dias que fiquei e tínhamos que ficar abrindo a tampa da descarga.